Creaky saddle? Oil it here with Liquid Wrench penetrant oil. I’ve had not one but two creaky bike seats in recent weeks. They’re both Avocet, a NOS Racing II and an ancient Gelflex. It just so happened they had the same issue, common with older saddles running a lot of miles. The seat rails just need a squirt of oil where they fit in the saddle. It dries up in there. Not just any oil. I found Liquid Wrench penetrant oil works best. Other oils may be too thick to soak in. 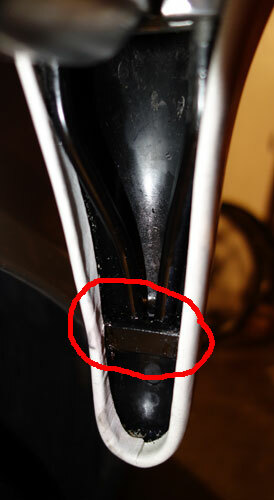 Be sure to tip the saddle vertical as shown in the photo. The saddle creak symptom only happens when you’re sitting in the saddle, usually while climbing. It won’t creak when you’re riding out of the saddle. This entry was posted on November 15, 2012 at 8:26 pm and is filed under Repair. You can follow any responses to this entry through the RSS 2.0 feed. You can leave a response, or trackback from your own site.